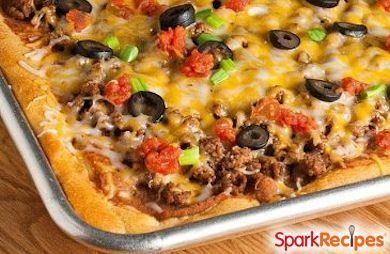 Whether served as a main dish or in bite-size slices, this simple, tasty pizza is perfect for your next party. Whether served as a main dish or in bite-size slices, this simple, tasty pizza is perfect for your next party. This is wonderful for a main dish, served with a salad and some whole grain Spanish rice. Cut them smaller for a great little appetizer too. It's almost like that yummy Mexican layered dip...but you don't need the chips. Add taco seasoning to the ground turkey according to the package directions. Press dough over the bottom and 1/2 inch up sides to form crust. Bake at 375 oven for 11 to 13 minutes or just until golden brown. Microwave beans in a microwave safe bowl for 1 minute (or until warmed through). Carefully spread beans over warm crust creating a thin layer. Top with cooked turkey mixture, sprinkle with cheese followed by tomatoes, black olives and green onion. Return to oven for 3-6 more minutes until cheese is melted. Serve immediately. Makes 12 main dish servings or 48 appetizers.